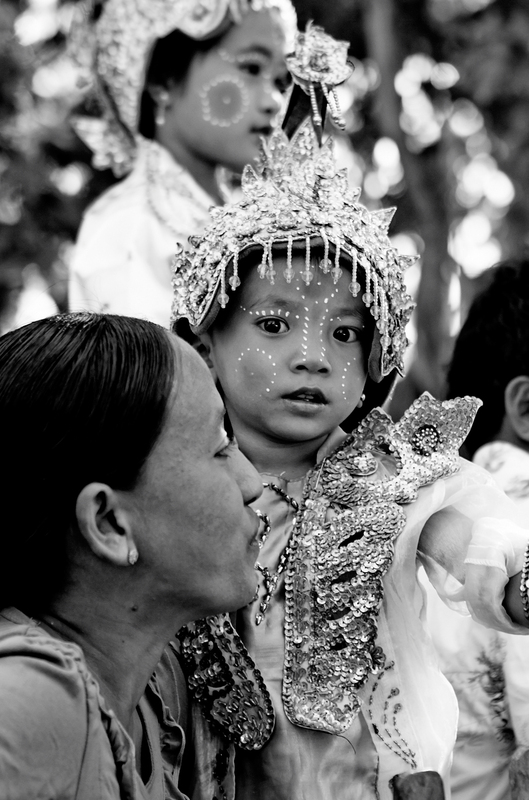 Photographer Anna Michell shares her observations of Myanmar's beauty. Myanmar, formally known as Burma, is often referred to as the jewel of Southeast Asia, rich in natural resources and a melting pot of cultures as it shares borders with Bangladesh, India, Tibet, China, Laos and Thailand. The country has been fought over for centuries, enduring colonisation by Britain, occupation by Japan, oppressive military rule, civil unrest and religious violence. With Aung San Suu Kyi’s release from house arrest in 2010 and her subsequent election as opposition leader in 2012, various EU sanctions were lifted which made tourism safer and enabled me to travel there. I hope that my photos and writing do justice to the beauty of Burma, a country that despite all the turmoil, is filled with incredibly welcoming people who are beautiful on the inside and out, who remain untainted by their difficult past. My first impression of Burma’s capital, Yangon, is of chaotic and colourful street life, where a quick walk will take you past people selling huge papayas, avocados (which they make into smoothies) aubergines and deep fried snacks being freshly made on almost every corner. The locals are so friendly, and respond happily when you smile at them. In more rural towns like Pyay, different styles of houses made with bamboo are juxtaposed with enormous banyan trees and papaya trees which shoot up through the crooked paving slabs like weeds. school children on bicycles compete for space on the roads with cows and goats. In the evenings the farmers come home from the fields with their ox and carts as huge leaves the size of dinner plates float lazily down from the trees, casting long shadows across the tree lined roads. Many women and men wear thanaka, a pale yellow paste made from the bark of the thanaka and wood apple tree. Its purpose is mostly for beauty, but it is said to have sun protection and antifungal properties as well as treating acne. Wearing thanaka is both practical and aesthic. At 22km long, the famous Inle Lake is so huge that it feels like you're going out to sea, until you pass wooden houses on tall stilts and gardens that float on beds of seagrass. Fishing and growing tomatoes on floating farms are a big part of life here but there are restaurants and other businesses on the lake such as jewellers and a weavers’ co-operative where women weave fabric from lotus stems. You could live your whole life here without ever stepping on dry land. Shop keeper at the weaver’s cooperative. Throughout the parts of Burma that I visited, I noticed that it is very common for men to wear nail varnish, from a young fruit seller in Yangon to a weathered old fisherman on Inle Lake. Keng Tung is the 2nd biggest city in Shan state and in the day it is very busy especially the market which is already in full swing at 7am. By 4.30pm however, almost everything is shut and when night falls it becomes like a ghost town. Very little street lighting is available and hardly any people are around except for the vehicles that are driving through on their way to Thailand or China, picking up dumplings or bags of noodle soup for their journeys. The people here are fascinatingly varied because it’s close to the border with Laos, China and Thailand. The town is a good base from which to trek, past rice paddies, banana trees and buffalo, winding up into the hills where rubber trees and dragon fruit cacti are cultivated, finally reaching the traditional villages of Akha and Palaung tribes in the mountains. The head-dress of an Akha woman is unique and hand made by its owner. Because it is a sign of wealth and status, richer women will incorporate as much silver as they can, as this is very expensive. My local guide told me they wear them all the time, even when they sleep, because they believe their souls can escape out of their heads. Ann people are animists and the women are recognisable because they dye their teeth black with charcoal to signify their marriage status. In the villages further from the cities, young people still retain some of these traditions. The majority of Burmese practise Buddhism and it is traditional for every young boy to live in the monastery as a novice monk for a period of time - it can be weeks or months. At the novitation ceremony the boys are dressed in resplendent clothes and parade through the street on horseback before going into the monastery. A novitation ceremony for boys becoming novice monks. I left Myanmar feeling like I had just scratched the surface of what this famous jewel had to offer. Even though it was all over too quickly, it was enough to learn something from the Burmese spirit of openness, strength, and acceptance of diversity. I learned that beauty is many different things; It is a small boy dedicating himself to spirituality, it is an old fisherman with sparkly nails and it is a woman with black teeth. It is celebrating difference, it is living on what the land gives you, it is making order from what appears to be chaos.